When a friend starring at his smartphone told me that the Canucks made a trade with the Florida Panthers, I could swear I saw a glitch in the Matrix. Seriously, this has happened so many times in recent years, it actually does give me some deja vu. The Vancouver-Florida connection continued this past Saturday with news that the Panthers had sent David Booth, Steve Reinprecht and a third-round draft pick in the 2013 draft (which is the same pick the Canucks sent to Florida at the deadline last year for Chris Higgins) in exchange for Mikael Samuelsson and Marco Sturm. While Sturm is in the lineup for the Panthers tonight and Booth will line up with Kesler and Chiggins tomorrow against the Edmonton Oilers, Samuelsson remains in Vancouver as he tries to get back to 100%. However, even if Sammy wasn’t on the mend, it will be at least a few months before we can begin to pick a winner in this trade. …but I’m sure as hell going to try anyways! But first, let’s go through the history of trades between these two regular dance partners, who between them have swapped some rather popular NHL stars in players like Roberto Luongo, Ed Jovanovski, Todd Bertuzzi and Pavel Bure. Before we get started, did you know that if the Canucks didn’t make the Cam Neely for Barry Pederson deal way back in ’86, the Bruins may never have drafted Milan Lucic 20 years later? It’s true! This is the sort of analysis you can look forward to in this series as I look at the Canucks/Panthers trade history and see how the deals have affected both teams at the time, today and all the time in between. You’ll see how a trade has long term consequences and shapes rosters for many years after it happens. This is the hockey version of the Butterfly effect, if you will. Background: This might look like a relatively insignificant trade but read on! It’s probably the most important in Panthers (and perhaps Canucks as a result) history! This was the earliest trade I could find between the two clubs as the Panthers joined the NHL in 1993 with the Anaheim Mighty Ducks. Belanger was signed by the Montreal Canadiens in 1990 but never held a regular spot in the lineup. He played a total of 23 games with the Canadiens between 1991-’93 before he was left unprotected by Montreal and selected by Florida in the 1993 NHL Expansion Draft. Belanger had his best statistical season after joining the Panthers in 1993-’94, putting up 50 points in 70 games (70GP-17G-33A-50P) but only another 67 points over the next 110 games with the organization (110GP-32G-35A-67P). 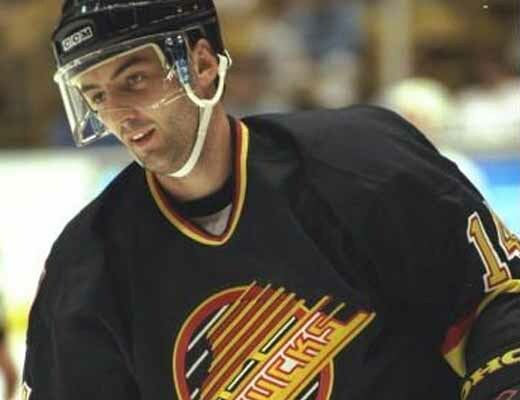 What Happened: After the trade at the deadline, Belanger played 9 games with the Canucks with a rather unimpressive statline, scoring only three goals (9GP-3G-0A-3P) in the remainder of the regular season and only two assists in 3 games during the 1995-’96 playoffs. The Canucks finished 7th in the West (1 point above 8th place the original Winnipeg Jets), losing in the first round in 6 games to the eventual Stanley Cup champion Colorado Avalanche. The Panthers, on the other hand, reached the Stanley Cup Finals for the first and only time in their franchise history but were swept by the aforementioned Avs. Belanger was released by the Canucks the following off-season and signed with the Edmonton Oilers. After appearing in only 6 games that season for the Oilers, Belanger popped up in the NHL two more times: once with the Canadiens in 1999-’00 (16GP-3G-6A-9P) and in 2000-’01 with the New York Islanders (12GP-0G-0A-0P). The ’01 season was the end of Belanger’s NHL career although he continued to play in the minors and overseas. Today, you can find him as a member of the Saint-Georges CRS Express with which he won a Lique Nord-Americaine de Hockey (North American Hockey League) championship in 2009-’10, the same year he was named the league’s Most Sportsman-like Player and a 1st team All-Star. Panthers: With the 65th overall pick in the 1996 NHL Entry Draft, the Panthers selected Oleg Kvasha, a 6-foot left wing from Moscow, Russia. Kvasha cracked the Panthers lineup in 1998-’99 and played 146 games over two seasons in Florida (146GP-17G-33A-50P). In 2000, he was traded in the off season by the Panthers along with fellow winger Mark Parrish to the New York Islanders for Roberto Luongo and Olli Jokinen…which simply has to be one of the most lopsided trades ever as both Luongo and Jokinen would become cornerstones of the Panthers franchise for years while Kvasha played 5 seasons for the Islanders (332GP-60G-96A-156P) with Parrish (who has also popped up with the Canucks recently on a try-out). Kvasha would be dealt from the Islanders to the Coyotes in 2005-’06, where he would finish his NHL career. Roberto Luongo was widely considered one of the best goaltenders at the time he was the Panthers starter. The teams in front of him were questionable defensively, which showed in the number of shots he routinely faced. During his time with the Panthers (318GP-108W-154L-35T), although the wins were scarce, Luongo set single season records for saves and shots faced. Luongo would later be traded to…yes, Vancouver. Jokinen on the other hand spent 7 seasons in Florida where he was captain from 2003 to when he was traded in 2008. In 7 seasons, he played 567 games and put up 419 points (567GP-188G-231A-419P). Luongo’s blockbuster trade brought Todd Bertuzzi, Bryan Allen and Alex Auld to the Panthers while Olli Jokinen was dealt for Nick Boynton, Keith Ballard and a second round pick in the 2008 draft. Bertuzzi only played 7 games for the Panthers that season due to a number of injuries before he would be traded to the Red Wings for Shawn Matthias and conditional picks. Allen would remain part of the Panthers defensive core for several seasons (284GP-14G-53A-67P) before the Panthers would trade him for Sergei Samsonov. Alex Auld played 27 games for Florida in 2006-’07 before leaving as an unrestricted free agent. The conditional pick in the Bertuzzi trade would be part of the Tomas Vokoun deal between the Nashville Predators and Panthers. Sergei Samsonov would play 20 games with the Panthers last season but is currently an unrestricted free agent. Vokoun would also leave the Panthers as a UFA but not before playing 4 seasons with the club (248GP-101W-108L-30OTL). In short, today as a result of the Luongo branch of the Kvasha/Parrish for Luongo/Jokinen trade, the Panthers have…Shawn Matthias. Nick Boynton would play a season with the Panthers (68GP-5G-16A-21P) before signing with Anaheim the year after as a UFA while Ballard would play two full seasons (164GP-14G-48A-62P) before being traded to Vancouver at the 2010 draft for Michael Grabner, Steve Bernier and Vancouver’s 1st round pick. Grabner was released by the Panthers last season before the Islanders picked him up on waivers on the way to his 31-goal, Calder trophy candidate season. Bernier would play a season with the Panthers but leave as a UFA (and he still is). The 1st round pick from the Ballard deal would be used to select Quinton Howden, a promising 19-year old prospect with the Moose Jaw Warriors of the WHL. The 2nd round pick included with the Olli Jokinen deal was first acquired from the Ottawa Senators. This was the 49th overall pick in 2008 and was later traded to the Nashville Predators in a package for the 46th overall pick. Pick #46 became Colby Robak while #49 became Jared Staal. Robak is still with the Panthers organization today as part of the San Antonio Rampage in the AHL. Today’s results: Shawn Matthias, Quinton Howden and Colby Robak. The Panthers obviously won this trade. Although…and I actually have to scroll up to remember his name…Jesse Belanger’s stint with the Canucks was brief, the 3rd round pick the Canucks dealt for him had ramifications throughout the history of the Panthers. Although they’ve lost many All-Star quality players that have turned up as a result of this deal, the Panthers still come out on top here with 2008 WJHC gold medalist Shawn Matthias and two early round prospects still on their roster as opposed to the brief-if-it-even-exists entry that Jesse Belanger has in the Canucks history books. The shrewdness here by the Panthers was turning two promising young players in Kvasha and Parrish (at the time they were) into better, more promising young players in Luongo and Jokinen. It really got the ball rolling for the franchise. Given the history in Florida…that’s probably the best trade they’ve ever made even if they don’t have much playoff (…or regular season, for that matter) success to show for it. Without this seemingly innocuous transaction between the two teams, perhaps Roberto Luongo never ends up in Florida…and later, as a result, Vancouver.